Abu Dhabi: Youth in the UAE can now use their smartphones as a remote control for nature to enjoy its beauty, as part of a new nationwide campaign. “The programme titled ‘Connect with Nature’ aims to encourage youngsters to go outdoors to wadis, beaches and deserts, and really understand and appreciate the importance of nature and how to conserve it,” a senior official told Gulf News. Laila Mustafa Abdul Latif, director-general of Emirates Nature-WWF (World Wide Fund for Nature), said youngsters can join the programme through its digital platforms — a website and mobile application, which will be launched soon. 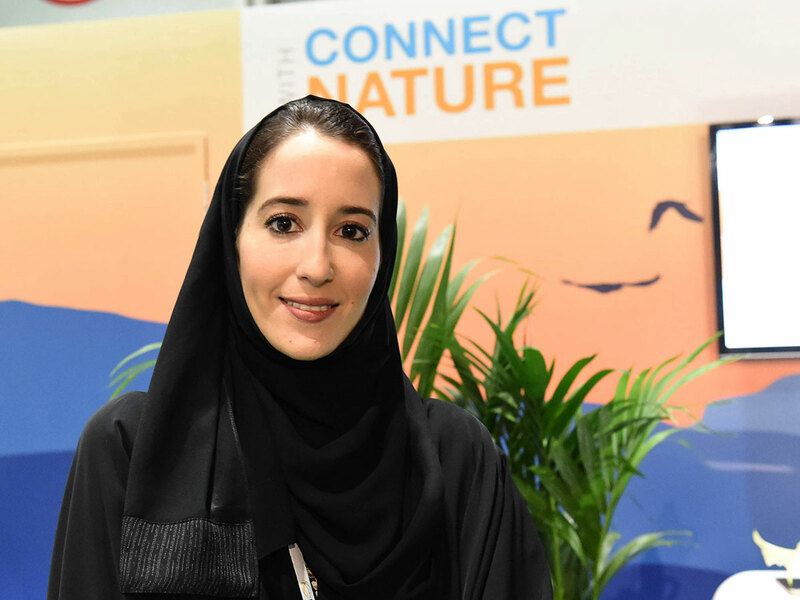 Laila Mustafa Abdul Latif talks about ‘Connect to Nature’ in a simulated wadi that introduced the programme to visitors at the Abu Dhabi Sustainability Week. A fun and interactive journey on the app will inspire the youth to unlock the mysteries of the natural world virtually or in real-life across 30 locations in the UAE, including Al Wathba Wetland Reserve, Saadiyat Marine National Park, Al Ain Oasis and Al Qudra Lake. “While visiting a place, they can take up challenges on the app, such as hiking and climbing etc, which help them further explore the place,” she said on Thursday, while showing a simulated wadi that introduced the programme to visitors at Abu Dhabi Sustainability Week (ADSW). The online platform offers special workshops and learning opportunities about the local environment through citizen science projects and research programmes to measure the impacts of climate change on local biodiversity. “These activities will inspire youth to look at everything through a ‘green lens’ and integrate sustainability into everything they do: work, life and play,” added Laila. Abdul Aziz Al Mulla, Conservation, Education & Outreach Coordinator at Emirates Nature (WWF) talks about ‘Nature Connect’ in a simulated wadi that introduced the programme to visitors at the Abu Dhabi Sustainability Week. The Environment Agency — Abu Dhabi (EAD), Emirates Nature-WWF and the International Fund for Houbara Conservation (IFHC) have partnered to implement the programme that targets youngsters aged between 15 and 24. “However, older people who are interested are also welcome to join the programme,” she said. “This truly iconic and innovative education initiative aims to bring to life a special journey where youth can discover the magic of nature around them while taking ownership of their conservation efforts. Through the programme, we aim to equip youth with the experiences, knowledge, skills, and platforms to be able to continue the environmental legacy of Shaikh Zayed Bin Sultan Al Nahyan. “We place great value on the importance of empowering the leaders of tomorrow, and recognising the imminent need for Emirati youth to re-connect to their natural heritage, and protecting the UAE’s rich biodiversity and many unique habitats. It is our duty to invoke a sense of community responsibility among the next generation of environmental ambassadors to drive change not only locally, but globally as well” she said. The launch ceremony of ‘Connect with Nature’ will be held in Abu Dhabi on Saturday at Umm Al Emarat Park from 3pm to 9pm. The ceremony will offer a visual presentation, and a sneak peek into what the programme will entail. Registration is open on the Emirates Nature-WWF website (www.emiratesnaturewwf.ae/en/what-we-do/connect-with-nature). Once the programme goes live, you will be able sign up as a member by downloading the app. Once live, the app will allow users learn about the programme, create personal profiles, manage progress, learn about events and news, progress onto levels, earn rewards, and access the knowledge hub, an online resource library where members can browse through audio clippings, images, eBooks, blogs videos, articles, reports, and infographics from top environmental agencies. Teachers can also access resources such as quizzes, teaching tools, and learning guides to complement their lesson planning. It offers adventure excursions, outreach activities and skills enhancement workshops that are scheduled throughout the year. These include night-time kayaking, mountain trekking, turtle-tagging trips, nature survival courses, fitness challenges, overnight desert camping, nature photography workshops, movie screenings and much more. It is a free mobile application that can be downloaded on to Android and IOS compatible devices. The activities are also free of cost. Can members play ‘Connect with Nature’ with friends? Members can choose to make their profiles public or keep them private as per their preference, and they can compete with their peers by creating a profile on the Connect with Nature app.